Dr. Rollan Roberts II has agreed to give away 5,000 copies of the "90 Day Race" book worth $50,000 in the month of April while supplies last. Whitefish, MT, April 01, 2014 --(PR.com)-- Dr. Rollan Roberts II and the 90 Day Race are pleased to announce The Great $50,000 Giveaway. Dr. Roberts is giving away $50,000 worth of the "90 Day Race" books to the first 5,000 customers while supplies last. Dr. Roberts has created and packaged the patent-pending 90 Day Race Corporate Program that includes visual coaching calls, workshops, 150 page workbook, custom "90 Day Race gift books and keynote speeches. “'The 90 Day Race' is ideal for individuals and companies looking to grow quickly and inspire their staff and sales teams to achieve new levels of excellence and revenue,” Dr. Roberts continued. For more information on The Great $50,000 Giveaway, please visit www.90DayRace.com/Giveaway. 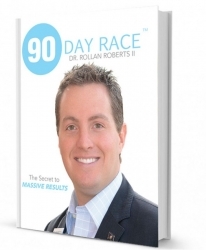 The "90 Day Race" book, program and coaching services are available at www.90DayRace.com. Dr. Rollan Roberts II has agreed to give away 5,000 copies of the 90 Day Race book worth $50,000 in the month of April while supplies last.